Apparently I have earned a reputation as a "Guardian of the Art". This is a wonderful compliment and it places a considerable responsibility on me to continue to protect the principal elements that characterize traditional, authentic Argentine Tango. Since I learned of this distinction I have taken on the responsibility to focus every class on improving the quality, clarity and precision of Connection, Dissociation and Improvisation - the essence of Argentine Tango. Connection: Gentle touch with focused concentration, the 'connection' is best described as transcendental. Partners focus on one another to develop an invisible but palpable relationship, defined by the desire to remain in a measured close proximity without interrupting or imposing on one another. Dissociation: With reference to self, dissociation is the separation and independent calculated movement of different parts of the body. With reference to partner, we develop an understanding of how the transfer of energy may be given and received consecutively, not concurrently, which is observed as 'energy in motion'. Improvisation: When the partners connect and have developed sufficient dissociation they are able to move in a uniquely coordinated way that allows the dance to be created in real time. Unplanned, unrehearsed. The ultimate freedom of expression. 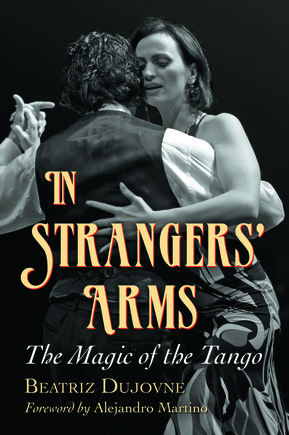 In Strangers' Arms - The Magic of the Tango is written by Beatrice Dujovne, my friend. The principal objective of Tango Fantástico is to promote the art and culture of Argentine Tango through instruction and demonstration. 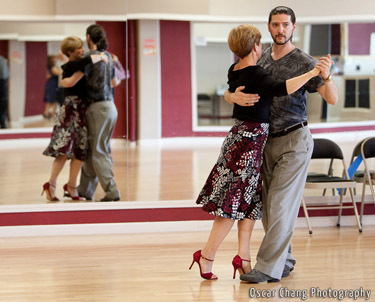 Often described as the seductive dance of one body with four legs, Argentine Tango is an expressive dance that follows artistic lines which are both improvised and led. The dancers become the music and the music is the dance. The tango embrace is close, soft and warm. Complicated improvised patterns are executed with precision and elegance; the tangling and unraveling of intertwined legs, deliberate and poised. The fluid movement of the dancers is captivating and unique - an improvised dance is never repeated.